Promises made, promises kept and a 100% satisfaction guarantee is what you can expect from Steve and Holly! Imagine you’ve been a successful real estate agent for 38 years. How is that possible? With dedication, tenacity, a strong desire to succeed, and with focused commitment to your clients. That’s exactly what has made Broker Owner Steve Markley an icon in the highly competitive real estate industry–it is what has also been the foundation for his and wife, Holly’s strength as a team, both professionally and personally. Both natives of Madison, Steve and Holly were married over 38 years ago. Steve graduated with an Associate Degree in Real Estate and Holly followed him into the real estate industry obtaining her broker’s license in 1995. Their journey began in Madison at St. Mary’s Hospital where they were born one year apart. Unbeknownst to each other, they attended the same high school–Madison East, yet they did not know each other until they met one year after graduation while attending UW-Madison. Of German descent, three of their parents grew up on Southern Wisconsin farms where their families spoke both German and English. “Our parents instilled a strong work ethic in us,” says Steve. In fact, Steve was a hardworking entrepreneur at a young age selling bait to local ﬁshermen in the Lake Mendota area. His interest in sales continued as he worked at local, well known stores selling men’s clothing and sporting goods. Steve also used to go along with his father doing construction and home maintenance on executive homes in Maple Bluff. “I truly believe that my interest in sales and real estate started at a young age and continued to grow as I acquired other skills while working with local building contractors. It all provided me with the insight and interest into the real estate profession I enjoy today,” states Steve. Holly’s part-time employment has focused on customer service through the medical ﬁeld. She works at the Department of Family Medicine. Previously she was at UW Hospital and Clinics. She also received her Associate Degree as a Medical Laboratory Technician. Holly is a personable and empathetic person who possesses a high degree of detail and accuracy to the work she does. 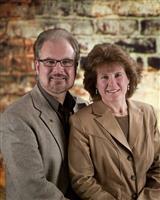 She is a team partner with Steve in their real estate business. Steve and Holly’s strengths complement each other as a team. Their experience and track record have provided them with the strength of credibility. Steve has consistently been a top producer every year and weathered through some tough economic times in the real estate industry. When interest rates were high during the 1980’s and the market was tough, as well as the housing bubble bursting in 2008, they survived because of his diligence and tenacity. “We saw many bankruptcies and foreclosures. How did we survive? We found creative ways to get the job done. I guess you could say that after all these years we have withstood the test of time.” And their hard work has paid off, consistently placing him in the top ranking group of REALTORS® in South Central Wisconsin. Continuing education is important to their continued success. Steve has earned his CRS, ABR, and GRI designations and completed the appraisal course toward state licensing, while Holly has earned her CRS, ABR and GRI designations. MARKLEY & ASSOCIATES REALTORS LLC.